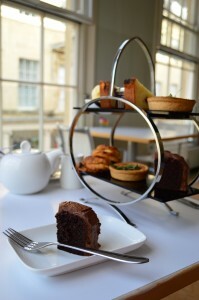 When I was rifling through the many, many Great Bath Feast events on offer this year, this one definitely caught my eye – a long, relaxing afternoon in the unique natural mineral waters of the Thermae Spa, including the opportunity to sit around in a waffle robe drinking prosecco and eating cake. How could I possibly resist? The short answer is that I couldn’t, so I promptly booked the package and got Mr Spotlight to wangle a day off work in order to accompany me. 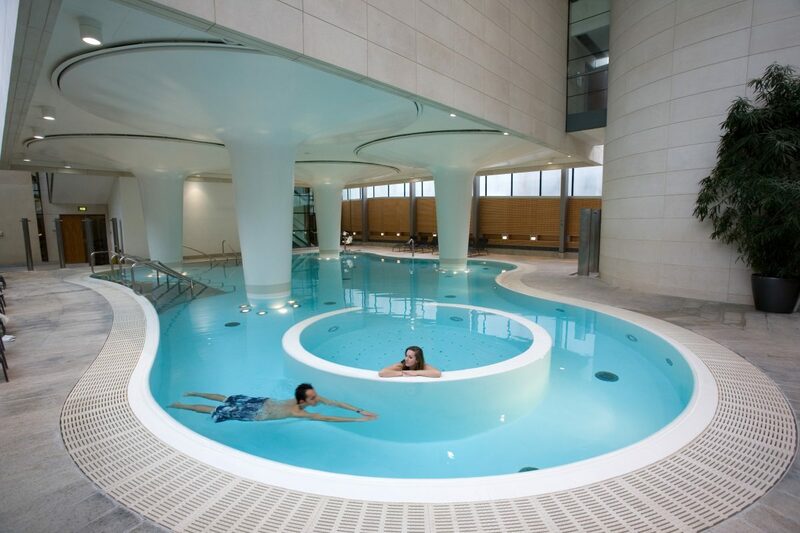 Just entering the lobby of the Thermae Spa instantly makes you relax – the elusive wafting scents of the steam rooms upstairs, the sound of the waterfall behind the front desk, and the huge piles of fluffy white towels. We popped upstairs for a photoshoot with the tea and cakes in question, and then had a quick peek inside the exclusive Cross Bath, a compact, elegant Georgian building with roof open to the stars, housing a large round bath that can be hired for parties (with dainties and champagne provided upon request). Then we gathered up our robes and slippers and headed into the spa proper for an afternoon of serious relaxation. The Tea for Two package gives you three hours in the spa, so that’s plenty of time to enjoy the whole experience and polish off your tea without feeling rushed. As I recommend you do, we proceeded in the traditional fashion, from bottom to top, starting with the Minerva Bath in the beautiful vaulted space beneath street level. 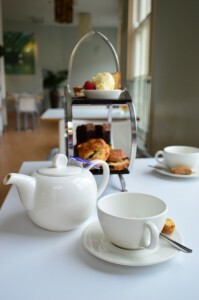 Here you can enjoy a fabulously frothy Jacuzzi, water jets that do an amazing neck and shoulder massage, and a gentle current that will carry you in a slow, wide circle around the pool without you having to so much as twitch a toe – so all you have to do is go completely limp and daydream about scones with jam and cream. Next, we moved up to the third floor, where you have a choice of four different deliciously scented steam rooms, guaranteed to draw every ounce of tension out of your pores. I’d recommend alternating each one with a blisteringly cold shower – it might sound unpleasant, but it’s actually completely fabulous in a way that’s impossible to explain. 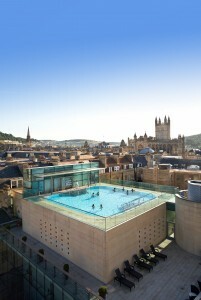 Finally, we headed to the famous rooftop pool for one of the best views in Bath, across the sunny golden rooftops to rolling green hills and woodland. One of my favourite things about this pool is that its appeal is undiminished regardless of the weather – on a sunny day, you could be on holiday in Florence, but it’s equally amazing to sink into the hot thermal waters under a gentle patter of rain or dramatic, lowering skies. Of course, with three hours to spend, you can just repeat this whole cycle as many times as you wish until you’re so relaxed you can barely operate the ties on your waffle robe, and we did just that. Finally, though, it was time to shower (the spa provides some scrumptious-smelling shower gel, shampoo and conditioner), get dressed and head to the café – although of course, if you want to eat in your dressing gown before returning to the baths for another soak, you should feel very welcome to (you certainly won’t be the only one). In the light and airy Springs Café, with a view over the cobbled Hot Bath Street, we gratefully accepted a glass of prosecco each and got stuck into our afternoon tea. 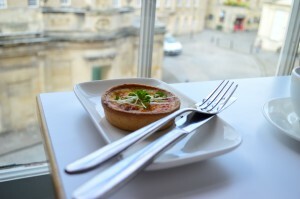 The smoked salmon sandwiches with dill cream cheese were a highlight for me, but I was a little disappointed by the savoury tarts, which weren’t quite as flavoursome as I had hoped. 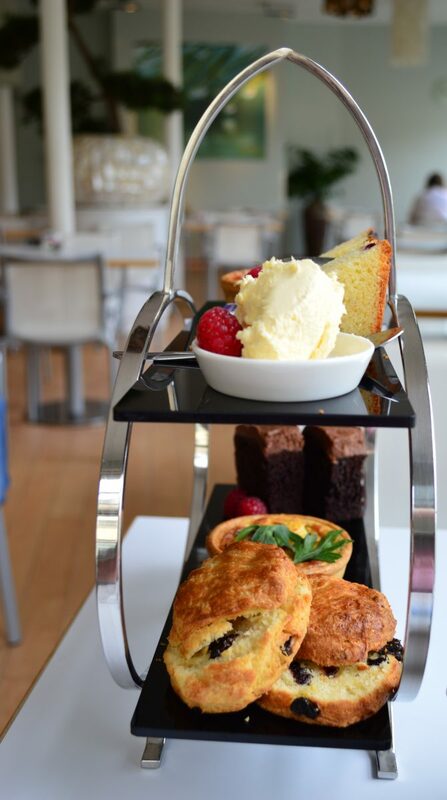 Where this afternoon tea really excels, though, is when it comes to cake – which is a lovely thing, as it’s a stumbling block for many an afternoon tea (trust me, I’ve eaten a lot of them). I couldn’t possibly pick between the gorgeously moist and fruity Solsbury Hill damson cake, and the rich, dark Chocolate and Bath Ale cake – they were both too good. A special mention must also go to the Orange & Cherry Scones – normally, I’d tell you not to mess with the perfection of a classic scone, but this flavour combination really worked. The whole package, for two people, including robes, towels, slippers, three hours in the spa and afternoon tea with prosecco, is £85, which considering that the basic entry charge is £32 per person, is a damn fine deal. 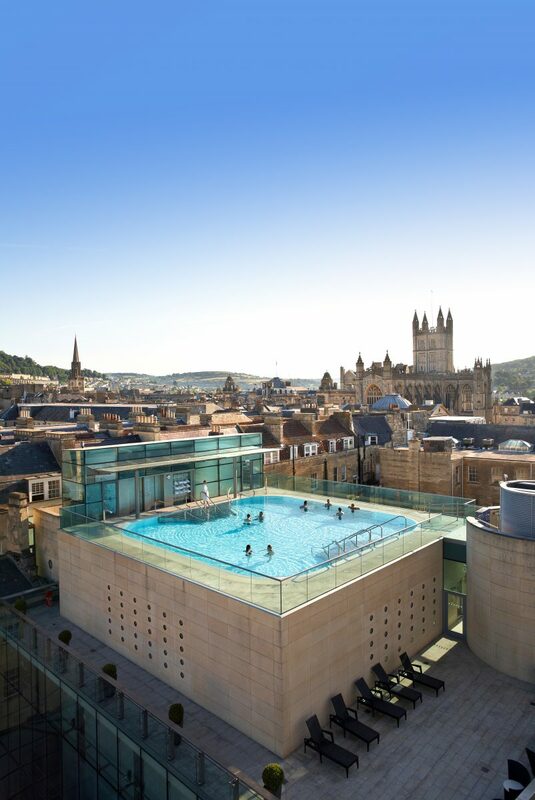 If you’re looking for a little indulgence in the centre of Bath, I’d definitely recommend it – the Thermae Spa is an experience not to be missed.